A convenient and efficient synthesis of 2-substituted benzothiazole derivatives are carried out by the one-pot reaction of 2-aminothiophenol with various aromatic aldehydes in using Bi2O3 nanoparticles as a catalyst at 60°C. The structure of the synthesized compounds have been confirmed on the basis of by FT-IR, H1 NMR, C13 NMR, Mass spectrometry and elemental analysis. This protocol afforded advantages i.e. purification of products by non-chromatographic method. Bi2O3 nanoparticles is cheap, readily available, versatile, environment friendly and recyclable. The reaction has been carried out in ethanol, thus eliminating hazardous organic solvents. Heterocyclics have received considerable attention from the synthetic and medicinal chemistry community due to their widespread presence in the biologically and therapeutically active compounds [1-3]. Benzofused heteroatomic compounds having sulfur as heteroatom are broadly observed in natural products and used as drugs . Various benzothiazole derivatives have been widely used due to their remarkable biological and pharmaceutical properties including, antifungal , antimicrobial [6,7], antitumor [8-12], anticonvulsant [13,14], antidiabetic , antiviral , anti-inflammatory [17,18], and enzyme inhibitory activity [19-21]. Thus, benzothiazole moiety is advantaged heterocyclic nucleus which has been used largely in medicinal chemistry, therefore much effort has been devoted to preparation of the benzothiazole derivatives. Over the years, many methodologies have been developed to synthesize the benzothiazole. Among all these methods, the most frequently used method is the condensation of 2-aminothiophenols with aldehydes. Generally, the catalysts used for this reaction are cyanide , copper(I) , chlorobenzene , yttrium chloride (YCl3) , tungstate sulfuric acid , molecular Iodine , Animal bone meal , propylphosphonic anhydride , aminoxyl radical/oxygen , and some oxidants in excess, such as K2S2O8 , POCl3 , and H2O2 [33,34] were used. In some cases, microwave irradiations were also used to improve the synthesis process [35-37]. Even though, by using the above reagents and catalysts the synthetic reaction of benzothiazole could be accelerated, several drawbacks were also occurred including, extreme reaction conditions, longer reaction time and by-product formation and tedious workup procedure. As a consequence, search for a new catalyst or reagent to synthesize benzothiazole is still a challenge for chemists. Nanocatalysts have a high surface area compared to the bulk counterparts, which results in having a high catalytic activity. So, they have attracted a great deal of attention from researchers. Nano-metal oxides such as ZnO nanoparticles , nano solid acid catalysts , CuO nano-particles , have been employed as catalysts for synthesis of the benzothiazole. Recently, bismuth (III) compounds have recently attracted much attention in organic synthesis due to their high acidity, low toxicity, and good stability. Herein we report a novel methodology to synthesize benzothiazole derivatives by refluxing at 60 °C, 2-aminothiophenol with various aromatic aldehydes in ethanol using bismuth (III) oxide nanoparticles as a heterogeneous, non toxic and eco-friendly catalyst (Scheme 1). A significant industrial advantage of heterogeneous catalysis is in the ability to easily remove the catalyst from the reaction mixture and reuse it for next run without any remarkable loss of activity. At the end of the reaction, the catalyst was separated by filtration, washed with acetone and then with double distilled water several times. Scheme 1. Synthesis of benzothiazole derivatives. Initially benzaldehyde (1 mmol) was treated with 2-aminothiophenol in ethanol in the absence of catalyst. No product was obtained at room temperature after 24 h (Table 1, entry 8). To determine the best experimental conditions, the reaction was carried out in the presence of 0.02 g Bi2O3 nanoparticles in ethanol at room temperature. The reaction proceeded smoothly to give the 2-substituted benzothiazole in 30 % yield after 24 h (Table 1, entry 12). When the same reaction was carried out under solvent-free conditions, the product was obtained 25% yield after 24 h (Table 1, entry 13). The best results were obtained in the presence of 0.02 g Bi2O3 nanoparticles in ethanol at 60 °C, temperature (Table 1, entry 9). Therefore ethanol is a good solvent for chemical reactions for safety, cost, and environmental concerns. We have found that this reaction gives high yields of products under the reflux conditions after short reaction times. Table 1. Optimizations of reaction conditions. Table 2. Synthesis of 2-substituted benzothiazoles. Optimization of catalyst on the rate of the reaction was also studied by varying the amount of the catalyst. The result revealed that 0.02 g of Bi2O3 nanoparticle is sufficient to carry out the reaction. When the amount of Bi2O3 nanoparticles was lower and higher than 0.02 g, no significant change in the yields of the product was observed (Table 3). Optimization of the solvent for the reaction of benzaldehyde derivatives with 2-aminothiophenol and the results were shown in Table 4.
a. Reaction was performed with benzaldehyde (1.0 mmol), o-aminothiophenol (1.0mmol) in the presence of 10mol% Bi2O3 nanoparticles as the catalyst in different solvents. b. Reaction time monitored by TLC. All the chemicals were commercially received from Sigma-Aldrich. Melting points of the compounds were determined using an open capillary tube melting point apparatus and are uncorrected. FT-IR spectra were recorded in the range 400-4000 cm-1 of samples as KBr pellets with a Perkin Elmer FTIR spectrophotometer. Mass spectra were recorded in the range 40-800 amu on a Shimadzu Japan GCMS-QP2010 Ultra apparatus. NMR spectra was recorded with a Bruker AV III spectrometer at 400 MHz (1H NMR) and 100 MHz (13C NMR) using CDCl3 as the solvent with tetramethylsilane (TMS) as internal standard. A mixture of 2-aminothiophenol (1mmol), ethanol (5mL), and bismuth (III) oxide nanoparticles (10 mol %) was taken in a round bottom flask. Then, a solution of aromatic aldehydes (1 mmol) was added drop wise with stirring for synthesizing 2-substituted benzothiazole. Stirring was continued under heating condition of at 60 oC, till the reaction gets completed. Reaction progress was monitored by TLC (thin layer chromatography) using hexane and ethyl acetate (9:1) as elutents. After the completion of reaction, the reaction mixture was cooled down to room temperature and the resulting solid was collected by filtration. The solid was dissolved in 20 ml ethyl acetate and catalyst was recovered by filtration. After evaporation of the solvent, the resulting solid product was purified by column chromatography over silica gel using n-hexane: ethylacetate (9:1, v/v) as the eluting solvent system, yielding the pure products. According to the aforementioned observations, a tentative reaction mechanism is outlined in the Scheme-2. The present reaction consists of Schiff base formation, intramolecular cyclization, dioxygen activation and heterocyclic compounds oxidation. Condensation of aminothiophenol 1a and aldehydes 2a generates the corresponding Schiff base 3a with Bi2O3 nanoparticles as accelerant. The oxidative cyclization of Schiff base 3a could be envisioned to form heterocycle 4a which then undergoes aerobic oxidation to yield the desired product 5a. We have successfully developed a green and efficient one-pot methodology for synthesis of the 2-substituted benzothiazole derivatives using Bi2O3 nanoparticles as a catalyst in ethanol as solvent with excellent yields. Purifications achieved without the use of traditional chromatographic procedures. In this methodology we suggest the further alternative possibility for formation of the fully 2-substituted benzoth-iazole derivatives. Scheme 2. A mechanism proposed for the synthesis of 2-substituted benzothiazole derivatives. The authors would like to appreciate the School of Studies in Chemistry, Jiwaji University, Gwalior and the Central Library Jiwaji University Gwalior for their support. How to cite this manuscript: Jyoti Sharma*, Ravi Bansal, Pradeep K. Soni, Swati Singh and Anand. K. Halve. 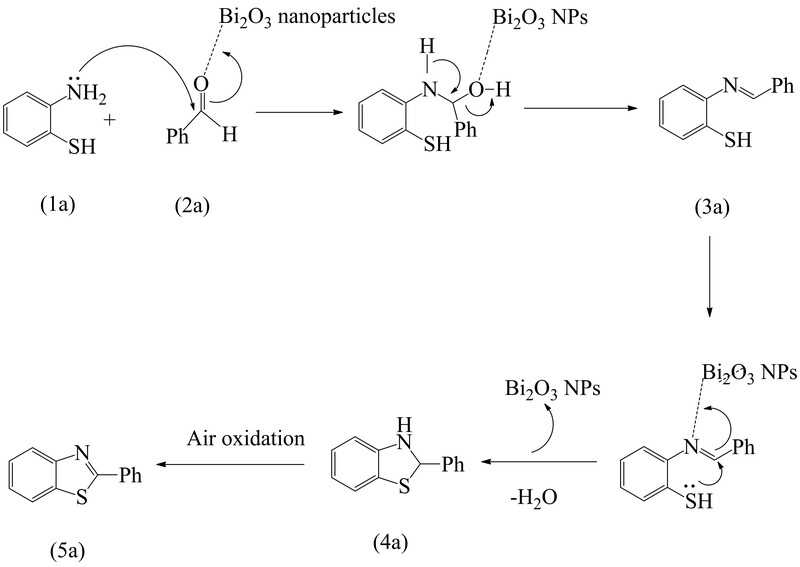 One Pot synthesis of 2-substituted benzothiazoles catalyzed by Bi2O3 nanoparticles. 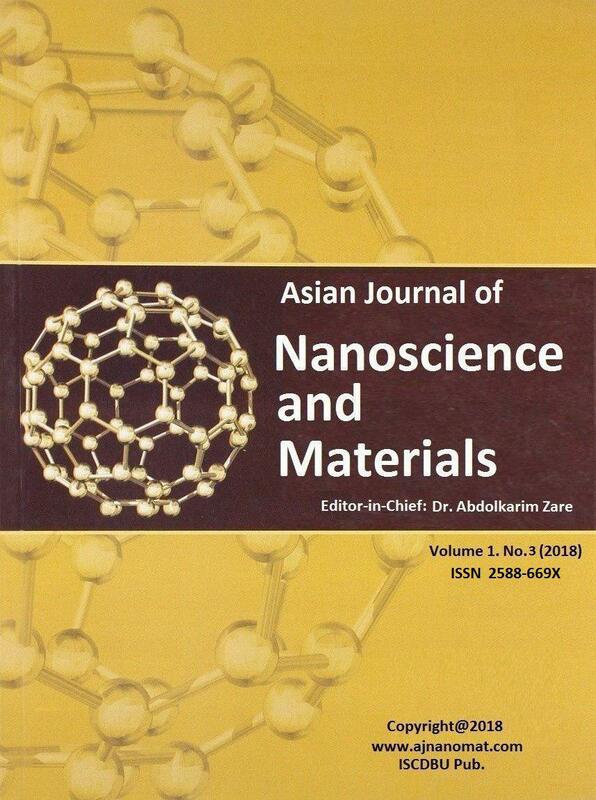 Asian Journal of Nanoscience and Materials, 2018, 1, 133-140. 1. H. Razavi, S. K. Palaninathan, E. T. Powers, R. L. Wiseman, H. E. Purkey, N. N. Mohamedmohaideen, S. Deechongkit, K. P. Chiang, M. T. A. Dendle, J. C. Sacchettini and J. W. Kelly (2003) Angew. Chem. Int. Ed. 42: 2758-61. 2. P.Y. Coqueron, C. Didier and M.A. Ciufolini (2003) Angew. Chem. Int. Ed. 42: 1411-1414. 3. T.E. Smith, W.H. Kuo, E.P. Balskus, V.D. Bock, J.L. Roizen, A.B. Theberge, K.A. Carroll, T. Kurihara and J.D. Wessler (2008) J. Org. Chem. 73: 142-150. 4. R. Sompalle and S.M. Roopan (2014) Chem. Sci. Rev. Lett. 2: 408-414; (b) P.S. Yadav, D. Devprakash and G.P. Senthilkumar (2011) Int. J. Pharm. Sci. Drug Res.3: 1-7. 5. W. Huang and G.F. Yang (2006) Bioorg. Med. Chem. 14: 8280-8285; (b) C. Sheng, X. Che, W. Wang, S. Wang, Y. Cao, J. Yao, Z. Miao and W. Zhang (2011) Eur. J. Med.Chem. 46: 1706-1712. 6. S. Bondock, W. Fadaly and M.A. Metwally (2009) Eur. J. Med. Chem. 44: 4813-4818. 7. S. Saeed, N. Rashid, P.G. Jones, M. Ali and R. Hussain (2010) Eur. J. Med. Chem. 45: 1323-1331. 8. I. Hutchinson, S.A. Jennings, B.R. Vishnuvajjala, A.D. Westwell and M.F.G. Stevens (2002) J. Med. Chem. 45: 744-747. 9. S. Aiello, G. Wells, E.L. Stone, H. Kadri, R. Bazzi, D.R. Bell, M.F.G. Stevens, C.S. Matthews and T.D. Bradshaw (2008) J. Med. Chem. 51: 5135-5239. 10. V.R. Solomon, C. Hu and H. Lee (2009) Bioorg. Med. Chem. 17: 7585-7592. 11. L. Racane, M. Kralj, L. Suman, R. Stojkovic´, V. Tralic´-Kulenovic´ and G. Karminski-Zamola (2010) Bioorg. Med. Chem. 18: 1038-1044. 12. S. Tzanopoulou, M. Sagnou, M. Paravatou-Petsotas, E. Gourni, G. Loudos, S. Xanthopoulos, D. Lafkas, H. Kiaris, A. Varvarigou, I.C. Pirmettis, M. Papadopoulos and M. Pelecanou (2010) J. Med. Chem. 53: 4633-4641. 13. V. G. Ugale, H. M. Patel, S. G. Wadodkar, S. B. Bari, A. A. Shirkhedkar, S. J. Surana (2012) Eur. J. Med. Chem. 53: 107-113. 14. A. Zablotskaya, I. Segal, A. Geronikaki, T. Eremkina, S. Belyakov, M. Petrova, I. Shestakova, L. Zvejniecea and V. Nikolajeva (2013) Eur. J. Med. Chem. 70: 846-856. 15. G. Mariappan, P. Prabhat, L. Sutharson, J. Banerjee, U. Patangia and S. Nath (2012) J. Korean Chem. Soc. 56: 251-256. 16. S. R. Nagarajan, G. A. De Crescenzo, D. P. Getman, H. F. Lu, J. A. Sikorski, J. L. Walker, J. J. McDonald, K. A. Houseman, G. P. Kocan, N. Kishore, P. P. Mehta, C. L. Funkes-Shippy and L. Blystone (2003) Bioorg. Med. Chem. 11: 4769-4777. 17. P. Patel, J. Pillai, N. Darji and B. Patel (2012) Int. J. Drug Res. Technol. 2: 170-176. 18. S. Shafi, M.M. Alam, N. Mulakayala, C. Mulakayala, G. Vanaja, A.M. Kalle, R. Pallu and M.S. Alam (2012) Eur. J. Med. Chem. 49: 324-333. 19. S.L. Johnson, L.H. Chen, E. Barile, A. Emdadi, M. Sabet, H. Yuan, J. Wei, D. Guiney and M. Pellecchia (2009) Bioorg. Med. Chem. 17: 3352-3368. 20. K.M. Khan, F. Rahim, S.A. Halim, M. Taha, M. Khan, S. Perveen, M. Zaheer-ul-Haq, M.A. Mesaik and M.I. Choudhary (2011) Bioorg. Med. Chem. 19: 4286-4294. 21. L. Huang, T. Su, W. Shan, Z. Luo, Y. Sun, F. He and X. Li (2012) Bioorg. Med. Chem. 20: 3038-3048. 22. Y.H. Cho, C.Y. Lee, D.C. Ha and C.H. Cheon (2012) Adv. Synth. Catal. 354: 2992-2996. 23. N. Park, Y. Heo, M.R. Kumar, Y. Kim and S. Lee (2012) Eur. J. Org. Chem. 2012: 1984-1993. 24. Y. Liao, H. Qi, S. Chen, Pengcheng Jiang, Wang Zhou, and Guo-Jun Deng (2012) Org. Lett. 14: 6004-6007. 25. L.Y. Fan, Y.H. Shang, X.X. Li and W.J. Hua (2015) Chin. Chem. Lett. 26: 77-80. 26. M. Farahi, B. Karami and M. Azari (2013) Comptes Rendus Chimie. 16: 1029-1034. 27. F. M. Moghaddam, G. R. Bardajee, H. Ismaili and S.M.D. Taimoory (2006) Synth. commun. 36: 2543-2548. 28. Y. Raidi, R. Mamouni, R. Azzalou, M. E. Haddad, S. Routier, G. Guillaumet and S. Lazar (2011) Tetrahedron Lett. 52: 3492-3495. 29. X. Wen, J.E. Bakali, R.D. Poulain, and B. Deprez (2012) Tetrahedron Lett. 53: 2440-2443. 30. Y-X Chen, L-F Qian, W. Zhang, and B. Han (2008) Angew. Chem. Int. Ed. 47: 9330-9333. 31. Z. Yang, X. Chen, S. Wang, J. Liu, K. Xie, A. Wang, Z. Tan (2012) J. Org. Chem. 77: 7086-7091. 32. G. H. Sung, I.H. Lee, B.R. Kim, D. S. Shin, J.J. Kim, S.G. Lee and Y.J. Yoon (2013) Tetrahedron 69: 3530-3535. 33. K. Bahrami, M.M. Khodaei and F. Naali (2008) J. Org. Chem. 73: 6835-6837. 34. H. Y. Guo, J.C. Li and Y.L. Shang (2009) Chin. Chem. Lett. 20: 1408-1410. 35. C. Praveen, A. Nandakumar, P. Dheenkumar, D. Muralidharan and P. Perumal (2012) J. Chem. Sci. 124: 609-624. 36. T.G. Deligeorgiev, S. Kaloyanova, A. Vasilev and J.J. Vaquero (2010) J. Phosphorus, Sulfur Silicon Relat. Elem.185: 2292-2302. 37. M. Kodomari, Y. Tamaru and T. Aoyama (2004) Synth. Commun.34: 3029-3036. 38. S. Banerjee, S. Payra and A. Saha (2014) Tetrahedron Lett. 55: 5515-5520. 39. A. Teimouri, A.N. Chermahini, H. Salavati and L. Ghorbanian (2013) J. mol. Catal. A: chem. 373: 38-45. 40. S. M. Inamdar, V. K. More and S. K. Mandal (2013) Tetrahedron Lett. 54: 579-583.